Atheneum Books for Young Readers, 9781442434233, 208pp. 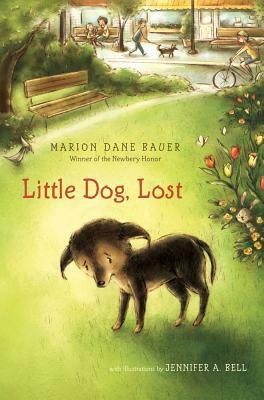 From Newbery Honoree Marion Dane Bauer comes the tale of a boy who needs a dog, and a dog who needs a boy—a match made in heaven, if only the two can meet. Buddy is a dog who needs a boy. Buddy has an owner already, but not one who understands the kind of love and care—the “something more”—a dog needs. Over the course of a summer thunderstorm and one chaotic town council meeting, these three characters cross paths and come together in a timeless tale ripe with emotions and told in verse that resolves with love, understanding, and a sense of belonging—plus a place to play a game of fetch! "Here is a tale that warms the heart from top to bottom and back again. This is storytelling in all its glory." * "Wholly satisfying.... A perfect selection for pet lovers new to chapter books and anyone who just enjoys a cheerful dog story." "Newbery Honor–author Bauer (On My Honor) crafts distinct voices for each character and develops a strong sense of place in the close-knit town of Erthly. . . . Any child who has ever longed for a pet or tried to convince a parent to give in to a dear wish will identify with Mark."